The beginning of a new year is often a time for evaluation, assessing, and planning for the upcoming twelve months. We analyze things like our health, our spiritual direction, our priorities, our careers and set goals regarding what we would like to do different, better, or not at all. 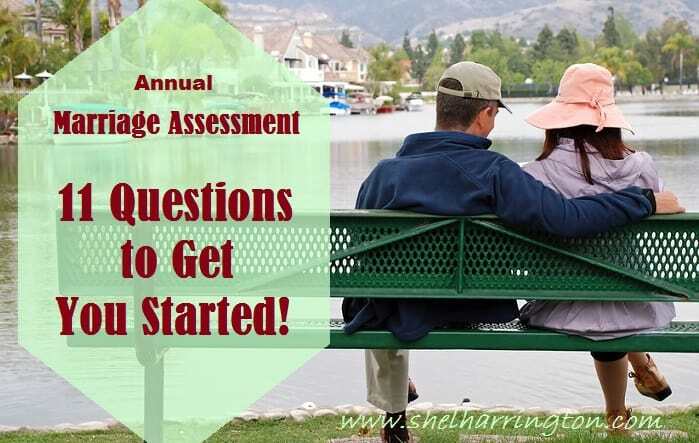 Let’s not forget our marriage in this annual assessment! The beginning of the year is a great time to review the past year of marriage to assess what we did right, what is not working, what we can do better, what changes we can make to improve our marriage, and what goals we can work together to accomplish over the next year. Here are 11 questions to get you started. Is there anybody in your life that is not supportive of your marriage or tries to undermine your relationship that you should consider limiting contact with this year? Do you need to cultivate some couple friends this year who have positive attitudes about marriage to interact with? What’s the single most important thing you could do to improve your marriage this year? What’s the most important decision you need to make together this year? What is the biggest obligation you feel needs to be met this year? What area of your lives most need simplifying and what is one thing you could do to accomplish that? If one or both of you need to get healthier, what is one change you could both support making to move toward that goal? What is your biggest financial goal and what is one thing you could do this year to move closer to that goal? If there is a time-waster activity that gets in the way of spending time with your spouse, what can you do about it this year? What can you do to encourage/uplift your spouse on a regular basis this year? What one change can you make that would help you be a better husband or wife this year? Whether we are already amazing or working toward getting there, it’s easy to get caught up in the New Year changes we want to make to be better individuals. Make sure you spend at least, if not more, energy and effort with your spouse to determine what you can do to enhance your already-amazing (or on-its-way-to-amazing) marriage in the upcoming year! I suspect no one likes to admit that taking an honest inventory like this is a good idea. But it is. These are honest and important questions for any couple no mattter what their marriage looks like. And it can actually be an enjoyable activity – discussing goals and making specific plans how to get there can have such great results! Using your expertise to help others before trouble enters the picture is amazing. And I agree with Lisa, regardless of where we are in our marriages, these are honest and important questions. Thank you for stirring us to do the difficult work. It’s so easy to take our most significant asset for granted! I hear so often that married couples “just drifted apart” – which often is another way of saying they didn’t intentionally come together and develop common goals. Thanks for your ongoing encouragement, DiAne! Great list, Shel! Encouraging each other is huge in my book! And it’s easy, free and fun with such great results! I’ll never understand how some seem to prefer complaining to encouraging. I think both are habits that develop – and one of them should be quashed! I love this list. I need to make sure not to get so busy with outside activities and instead get involved in things I can do with my spouse. Thanks for the reminder. It’s so easy to do, isn’t it Milissa? We’re all so busy and before we know it, we’re saying “goodnight” to our spouses and the day, with all those hours of opportunity to connect, are gone. We have to refuse to “drift apart” by being intentional about coming together on a regular basis. Which also happens to be very enjoyable! Excellent list. Like Jill, encouraging each other is at the top of our marriage list. I think that (mutual encouragement) has as much to do with the longevity of marriage as the love itself, Marylin! And the mutual benefits are off the charts! Shell these are all very important questions. Thank you I will be having a good think about how I can improve on my marriage. It is always a work in progress. As are WE, Kath! And hopefully, both just keep getting better! Thanks for this important list. Even longtime marriages need continual effort to last. I’ve noted a few of these that I need to work on! I agree with you about long-marrieds needing to be vigilant, Peggi – the longer the relationship the easier it is to fall into a pattern of taking the other for granted.